I still remember those exciting days of my youth when my older sister used to walk me to Bell Liberty Theater on Gage Ave. and cough up a couple of bucks so we could spend a good three or four hours in a dank, sticky-floor theater watching a double feature of Soul Man and An American Tail, The Lost Boys and Masters of the Universe, or Hamburger Hill and Full Metal Jacket. Now directors Quentin Tarantino and Robert Rodriguez have brought back the good old days of afternoon movie marathons that promised grainy film and a good deal with Grindhouse. The film--which is actually two films, one by Tarantino and Rodriguez apiece--lovingly recreates that special eye-bleeding form of movie worship where the trailers are old, the seats are cheap, and the production is even cheaper. 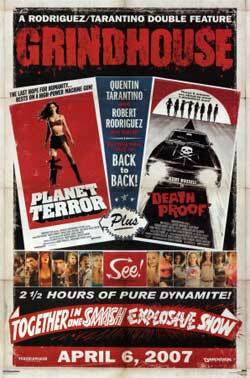 The two features of Grindhouse pay homage to the low-budget horror and sexploitation films of the 70s. There are shades of Tarantino and Rodriguez' last horror collaboration, From Dusk Till Dawn, but now each filmmaker's stamp is clearly confined to his own film. The cool chitty-chat of the first half of Dusk is now cordoned off into Tarantino's twisted girlfriend flick Death Proof (the second half of Grindhouse) and the camp and mayhem that dominated the second half of Dusk Till Dawn is now crammed into Rodriguez' zombiefest Planet Terror, which wisely opens Grindhouse. I'm a horror lover, and I preferred the all-balls-out action and gore of Planet Terror to the talky, suspense build-up of Death Proof, but these guys are lovers of movies, and their one-two punch comes off as a quality double feature by masters of the craft. Besides cool action and slick dialogue, Grindhouse is full of laughs and little nods, including cheesy pseudo-trailers guest directed by some familiar horror names like Eli Roth (Hostel) and Rob Zombie (House of 1000 Corpses). But Rodriguez' own preview for the fake Danny Trejo vehicle Machete, about a Mexican day-laborer-turned-assassin, is a movie I'd actually fork over a few more dollars to see. Here's hoping rumors of this crazy Spy Kids spin-off are true.